At least once a year, Last Chance Nordic Ski Club master skiers teach an introductory adult class covering basic skate skiing techniques. We will announce class dates here, and on the club’s email mailing list, once classes are scheduled. 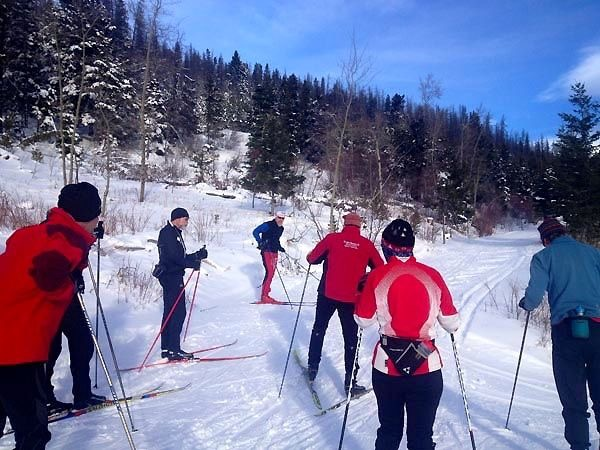 During the ski season, in addition to classes for youth, the Last Chance Nordic Ski Club offers a weekly master skiing class. The goal of these free classes is helping skiers improve all aspects of skate skiing and classic skiing. Classes include discussions on technique, waxing and training. Watch LCNSC’s web page and email distribution list for details. These sessions are for intermediate skiers, that is, skiers who have taken beginning lessons or are otherwise generally proficient, and who want to continue to improve their technique. Although these classes are not for first time skiers, we do have many skiers that are in the beginning stages of learning correct technique. ‘Master skiers’ are not necessarily experts, just established skiers who want to ski better. There is no age limit. Classes are divided into sub-groups based on ability. The first hour of most classes focus on technique, and during the remaining time skiers focus on training. The Master Skiers program is designed to improve skiers’ technique, strength, and speed – not necessarily to win races. The idea is to improve skills and fitness, ski with increased efficiency and have more fun doing so. Master classes are held weekly on the (numerically) odd day of the weekend. For instance, if a weekend’s dates are Saturday the 11th, and Sunday the 12th, the master class will be held on Saturday the 11th. Unless it is announced otherwise, on Saturdays the class will focus on skate technique, and Sundays on classic technique. This has the effect of working on skate technique one weekend, and classic the next. Classes begin at 10:00 am, at the Patrol Cabin, just beyond the Parking Lot trailhead. Updates and changes to this schedule are posted on the club members’ email mailing list. See the ‘About‘ page on this website. Many of the master skiers meet in the fall (or even in the summer) for dry-land practice or group roller ski sessions. Helena’s Scott Gerken has taken the lead for this program. Scott is an accomplished skier, and a gifted instructor. Participants in 2017-2018 masters’ clinics report learning a bunch, and having a great time. For women with some skate skiing experience.